“I was hoping you could help,” I said. The arch in his eyebrows really said it all. We put our heads together and came up with a doable list that would give my folks a good sampling of the heartland. My mother’s got a soft spot for antique shops, so there were a couple on her list that she remembered from a previous trip. She said, “We have to go back to the one that we saw when we went out and found all the barns,” and I thought, Oh, man, this is going to be a lot of driving. For the record, that’s a gene that has had a healthy run in my family–you know this one. It’s the old, “Turn right at the church and go over a few hills until you come to the house with the blue shutters” navigational system. You’d be surprised how often it actually works. As soon as we got on the right road, my mother recognized the innocuous little shop immediately. 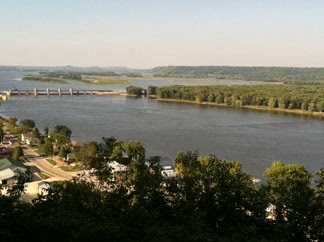 Also in Dubuque, we saw the Mississippi River museum. I learned that otters are especially cute when they are sleeping, and that there is at least one alligator in the state of Iowa (though he didn’t look happy about it). I also discovered an impressive army of wind-up toys in the gift shop (and simultaneously learned that I am still a huge dork because I was compelled to buy a few after trying out ALL of them). The museum also had the biggest catfish I’ve ever seen. 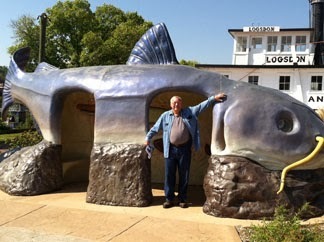 Here’s Dad standing inside of it. Yes, there is also a photo of me standing in it, but it’s on my mother’s camera. That’s my excuse. 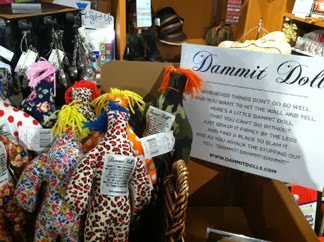 Also in the gift shop, I found these “Dammit Dolls,” which made me laugh out loud. Now I know what I’m getting my hot-tempered friends for their next birthdays. Our plan was to travel the “Great River Road”, which I think we found, since it seemed to be the only road on the map that followed the Mississippi. So we cruised with the river on our left, disappearing into the highest concentration of trees I’ve seen since moving there. 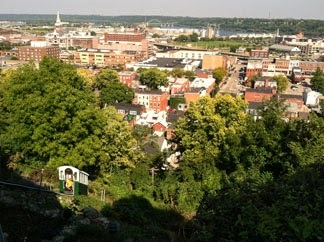 We stopped in the aptly named Belleview, where we found a remarkable lookout. Mom gave me explicit instructions to navigate back to this exact spot when I return to Iowa in a few weeks to make this shot in the “blue hour.” I’m still not entirely clear on this window of time, and according to her it shows up in film and is not something you can see with the naked eye. It sounds a lot like when you snap pictures and later see ghosts in them, and are completely unable to ever replicate it. But I’ll try. We continued south on Highway 52, in the “Let’s See Where This Take Us” spirit. Sometimes that attitude pays off big time, which is something I learned from my grandfather. Sometimes you get totally lost and end up in the middle of nowhere, but usually there’s something interesting that happens along the way that makes the detour worthwhile. Somehow or another. This time, we came across this bar that was for sale. 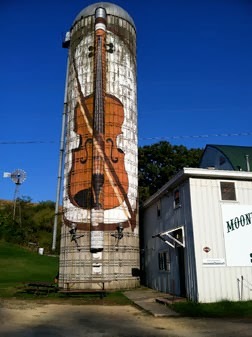 The adjacent silo had been painted and signed by a local artist, dated 1982. 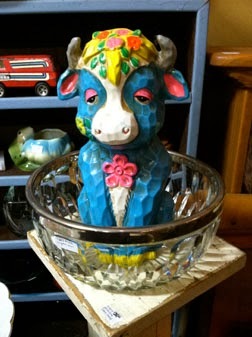 I hope the next buyer leaves it as is–I just love finding art in unexpected places. It reminds me that creativity is an inherent part of all of us, and it will always find its way out of us. And that was something I needed to be reminded of as I start over in my new setting and delve a little deeper into this art-driven life. Good timing, Iowa. Well-played.